No matter your style or locale, life isn’t worth living if you’re not getting your feet dirty from time to time. From the inner city to the mountain, your shoes will inevitably face the elements (even if those elements are in the form of an airborne double espresso). Unless you’re wearing sandals 24/7 (you’re not are you?) the look and longevity of your shoes is a worthy investment. Enter Jason Markk’s premium shoe cleaning gear. From sneakerhead to soccer dad, Jason Markk has a solution to keep your favorite kicks in shape for the long haul. The Essential Cleaning Kit includes a 4 oz bottle of their 98% natural, premium shoe cleaner (lasts about 100 pairs of shoes) and a shoe cleaning brush for dirt and all-around cleaning. Start here. Can’t stand that thought of going through the afternoon with a scuff on your shoes? The 12-pack of quick wipes is here to save the day. One side of the wipe contains small blue dots, which offers a slight abrasiveness and comes in handy when working out tougher stains – while the softer white side is great for general cleaning. 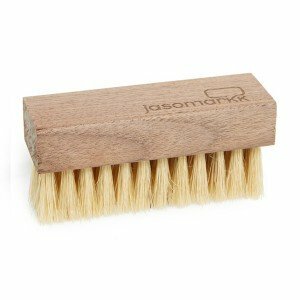 For leather, suede, and delicate materials like cotton mesh, the extra soft hog bristles of Jason Markk’s premium brush are your shoe’s new best friend. 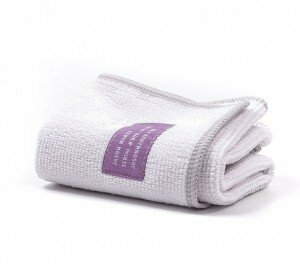 This lint free, non-abrasive, and hypoallergenic microfiber towel is great for general cleaning. And it’s machine washable so there’s no fuss.